When choosing a plastic barrel, stick to recycled food grade barrels, FDA approved. Preferably one that contained olives, vinegar, spices or any other type of food.You always have to think recycling. 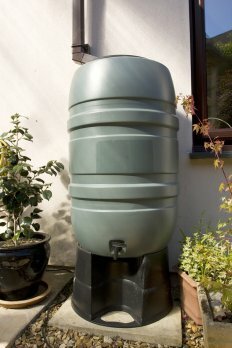 What's the advantage of plastic water barrels? Well one thing, you have to look at is that it's made of thick plastic, so this being said, it will take longer for the water to stagnate. The thickness of the plastic barrel is very important. Not only will it take longer for the water to deteriorate, it will also prevent sun light from going through and preventing algae growth within the barrel. If you do decide to go with a white barrel, you can either paint it, or place it in a shaded area, away from sunlight. Plastic water barrels are the easiest to use and care for. They are light weight, affordable, come in all shapes and colors and are quite solid, and made to withstand most types of weather. Of plastic and wooden barrels, plastic is far less expensive. Also depending on the look you want to give to your garden or your environment, you can seamlessly integrate or camouflage your barrel within your garden. You can always paint plastic especially a plastic rain barrel.